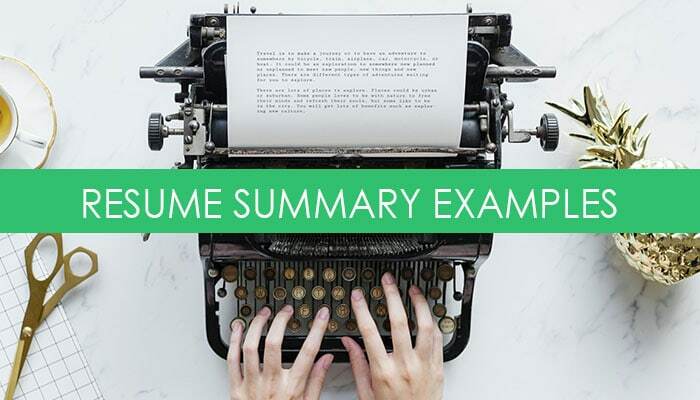 I often get asked by job seekers if they should include a resume summary statement. My answer is nearly always a resounding “YES”. The summary section of your resume is prime real estate — it’s the first thing a hiring manager will read, and it sets the tone for the rest of the document. You can use this section of your resume to create a compelling brand message that speaks to your most relevant skills, experience, and qualifications. What is a Summary on a Resume? The summary statement on a resume is typically 3-5 lines, in paragraph or bullet point format, used to introduce you as the candidate to your reader. The summary communicates key information such as your level of experience, your area of expertise, and your most marketable skills. Think of it as your elevator pitch – how would you concisely summarize your role and skill set to someone you just met? Do You Need a Summary on Your Resume? While it’s not required that you include a summary statement on your resume, it is recommended. The summary statement functions as your branding message – and you can easily tailor it depending on the role you’re targeting and the required skill sets. Without a summary statement, hiring managers will look directly at job titles, and potentially miss out on key information that may qualify you for the role. It’s also an excellent way to inject important keywords into your resume and optimize it for scanning by an Applicant Tracking System (ATS). So, how do you write a great summary statement for your resume? An effective resume summary statement should highlight your most valuable qualifications in a way that is both impactful and concise. What type of work are you targeting? Be specific about the role, company, and level. Example: With 6 years of experience, I’m targeting a mid-level account executive role within a large PR agency that works with travel and tourism companies. What are the top 5-10 skills required for the position? Refer to the job description for guidance. These are the most likely keywords that hiring managers and ATS will scan the resume for. What brand message do you want your audience to take away from the resume? This is the overall brand message that should resonate throughout the rest of the resume. What other skills will make you successful in this role? While these skills may not be directly related to the role, they may add additional value and set you apart from other candidates. What sets you apart from other candidates with a similar background? Examples: “I’ve been consistently promoted, and my work has been published in major media outlets”; or “I’ve built a strong network of media and client relationships”. Now piece it all together using the steps above. Accomplished PR professional and account executive with over 6 years of experience working with global brands in the travel and tourism space. Solid track record of managing communications strategies, crafting brand stories and identifying media opportunities that build brand visibility and engagement. Blends exceptional writing skills with experience training and mentoring junior associates. Brings a robust network of industry and media relationships, along with the ability to establish deep client relationships. Now let’s look at four more examples of great summary statements, and why they work. Your resume summary should begin with a powerful opening statement that grabs your reader’s attention. Each of these examples is concise, detailed, and follows the steps outlined above to highlight the candidate’s experience and qualifications. Results-oriented marketing specialist with experience creating integrated programs and brand strategy across digital, search, display, mobile, and social platforms. A high-level strategic thinker with strengths focusing on marketing, branding, account and vendor management, business development, research and analytics, relationship building, strategy, and planning. Proven team facilitator who leverages negotiation and relationship management skills to effectively mobilize cross-functional groups to achieve goals on time and on budget. Approaches projects with an understanding of a customers’ business to be able to tailor creative solutions and growth strategies. Proficient in Google Analytics, AdWords, Omniture, Visible Intelligence, Sysomos, Radian6, and Spanish. Over 10 years of experience crafting innovative communication strategies across print and digital media. Strengths focus on writing, editing, research, and project management, with expertise creating engaging content for diverse audiences. Approaches projects with passion and enthusiasm, demonstrating a strong work ethic and an appreciation for creative collaboration. Well-versed in AP and MLA style, HTML, social media platforms (Facebook, Instagram, Twitter, YouTube), and content management systems. Design Director with extensive experience guiding the development of global product lines and seasonal collections for luxury fashion brands. Excels at forecasting and adapting trends to fit within the brand image. Experience coordinating cross-functional teams and managing relationships with outside vendors, manufacturers, and strategic retail partners. Proven track record of delivering successful collections for private label, licensed lines, and brand collaborations. Digital media executive focused on driving revenue through the sale of integrated marketing solutions combining digital, mobile, video, print and events. Proven success in generating qualified leads, identifying potential opportunities, and closing large, complex deals. Establishes and grows account relationships across multiple industries (telecom, financial, technology, insurance, retail and luxury goods). Delivers solutions that meet clients’ key business needs while driving the highest level of client service. Download the DIY guide to writing your resume summary. The summary statement is an important marketing tool and sets the overall tone for your resume. As a rule of thumb, you should tailor the statement to match each job description you apply to so that it’s speaking to the exact skills and qualifications required for the role. Creating a strong statement that articulates your strengths, skills, and experiences can make the difference between a resume that gets overlooked and a one that makes it into the short-list pile. Tags: ATS, job search, resume, resume summary. Bookmark the permalink.